When the protective discs of your spine wear down with age or disease, your life may be sidelined with chronic pain and mobility issues. At Northwest Spine Center in The Woodlands, Texas, J. Michael Graham, Ph.D., M.D., offers both surgical and nonsurgical solutions for disc-related pain and other symptoms. Whether you need physical therapy or require surgery, Dr. Graham creates a treatment plan just for you. Learn more about your treatment options for disc problems by calling the office today, or book an appointment online. The discs in your spine are the cartilage cushions that fit between the spinal vertebral bones. The discs are responsible for absorbing the impact of your movements and protecting the health of your spinal column. Spinal discs also allow for a wide range of motion of the neck and back. The discs are also very important for spinal stability and strength. Due to age or degenerative disease, these discs can lose their cushioning and flexibility, no longer able to protect your vertebrae. As a result, you can experience a variety of symptoms, including a limited range of motion and chronic pain. A condition where the soft center of a disc pushes through the exterior, compressing surrounding nerves. A condition where bone spurs caused by arthritis or bulging or herniated discs cause pressure on a nerve which caused pain, numbness, tingling, and weakness. Aging and wear-and-tear can cause the spinal discs to wear out. Other contributing factors include smoking and heredity. Then the discs do not cushion very good anymore and do not hold the spinal bones together very good anymore. This can cause the development of neck or back pain and spinal arthritis. To determine the cause of your chronic pain, Dr. Graham reviews your medical history and discusses any injuries that may have triggered pain. He performs a full physical examination, evaluating your range of motion and flexibility. To view the structures of the vertebrae, Dr. Graham may request imaging tests, such as an X-ray or MRI. These tests can determine the type and extent of disc damage and give Dr. Graham the information he needs to properly treat your condition. What treatments are available for disc problems? Initially, you may benefit from physical therapy to improve the blood flow to your spine and strengthen the supporting muscles. To reduce inflammation in the spinal discs, Dr. Graham may recommend over-the-counter or prescription anti-inflammatory medication. Occasionally spinal injections help. When these therapies aren’t enough to enhance your overall functionality, Dr. Graham may suggest surgery. 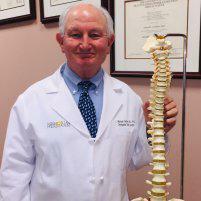 He offers both traditional and minimally invasive techniques to treat damaged discs. In some cases, he can remove a portion of the disc that presses on your nerves to achieve long-term pain relief. For severely damaged discs, he may need to remove the entire disc and fuse that area of the spine into one solid piece. End your struggle with disc-related pain by calling for an evaluation or using the online booking feature to schedule your appointment today.